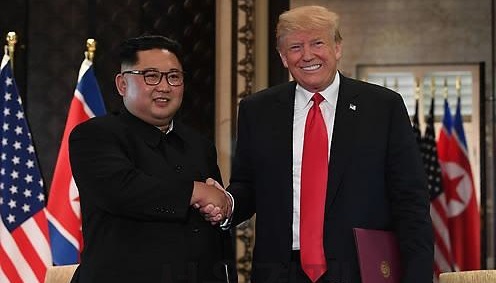 (CNN)President Donald Trump announced that his second summit with North Korean leader Kim Jong Un will take place in Hanoi, Vietnam, February 27 and 28. He later added, "North Korea, under the leadership of Kim Jong Un, will become a great Economic Powerhouse. He may surprise some but he won't surprise me, because I have gotten to know him & fully understand how capable he is. North Korea will become a different kind of Rocket - an Economic one!" Two Vietnamese cities -- Hanoi and Da Nang -- emerged as top contenders for the summit's location, according to a source familiar with the summit's planning. The choice of venue could be seen as a small concession by the US -- CNN reported that North Korea favored Hanoi because it has an embassy there, while the US preferred Da Nang because an Asian-Pacific Economic Cooperation summit was held there recently, which means the US has already conducted a full check, per a source familiar with the negotiations. CNN reported last week the choice would likely be Da Nang, but the plan was still being finalized. The announcement of the location for second summit comes just days after a confidential UN report found that the North Korean nuclear and missile program remains intact. And last week, intelligence officials warned that they believed North Korea was "unlikely to completely give up its nuclear weapons and production capability." But Trump has continued to paint a rosy picture of his relationship with the North Korean leader and the "tremendous progress" being made in negotiations. He previewed the upcoming summit during his State of the Union address earlier this week, emphasizing the "historic push for peace" on the Korean Peninsula. North Korea," Trump said Tuesday on Capitol Hill. Trump previously met with Kim in Singapore last summer, where the North Korean leader agreed to "work toward complete denuclearization of the Korean Peninsula." The State Department's top negotiator with North Korea, Stephen Biegun, released a statement Friday following a meeting in Pyongyang with North Korean officials, but did not mention a location for the summit. This story has been updated.